Over the last few months I’ve found myself in a bit of a creative rut, so I enrolled on an illustration evening course at the University of Hertfordshire. Tuesday was the first class and it was really good fun, in fact I had such a good time I’ve not really put my pencil down since. My mind is now once more inspired and I am constantly wanting to work on my ideas to show everyone next week. I thought I would share with you the outcome so far… our theme was “food fight”. 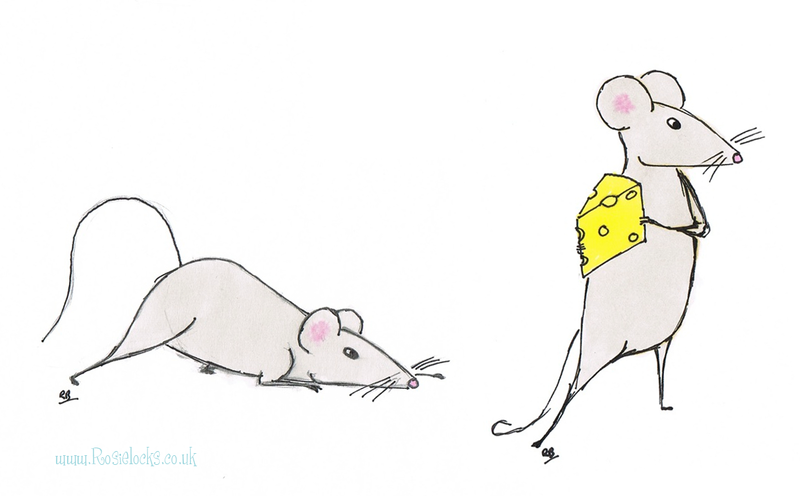 One mouse is about to pounce on the other who’s checking if the coast is clear to run off with his wedge of cheese. Developing them on my lunch breaks at work has meant I’ve not been able to use my usual tools like my scanner and light box. Its been great to do something virtually non-digital for a change. I treated my self to some Letraset Pro Markers too which I used to give some colour to them. Im really impressed with how they have come out on the animation paper, virtually seamless!! So enough from me for now! I will update them soon. This entry was posted in Uncategorized and tagged cheese, fight, food, illustration, mice.